This Explorer 46 Sedan was supplied by us from new to the current owner in 2014 and has been used for family cruising in and around the beautiful Hong Kong harbour and islands. This semi-displacement design offers superb performance across the speed range being equally at home in displacement mode at 8 - 10 knots or cruising all day in semi-displacement mode at 14 knots. For those rushing to get home, the boats top speed is circa 21 knots with a clean bottom. 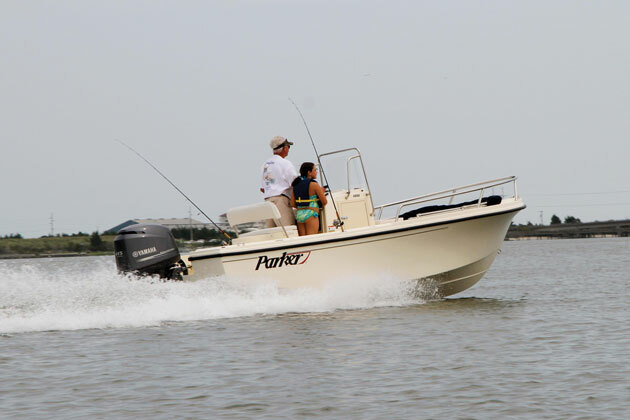 The boat is powered by a pair of new series Cummins 6.7-litre QSB common-rail diesels that offers quiet operation, laudable fuel economy and increased performance. We also installed upgraded fuel filtration to offer the clean diesel that these engines thrive on. 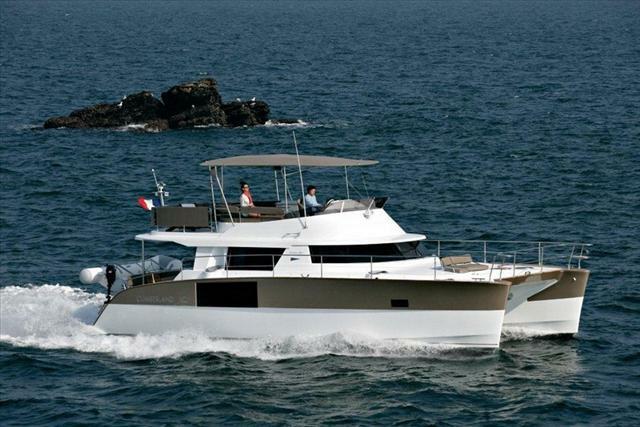 As with all Explorer trawler yacht designs, the accommodation is both spacious and exceptionally comfortable. 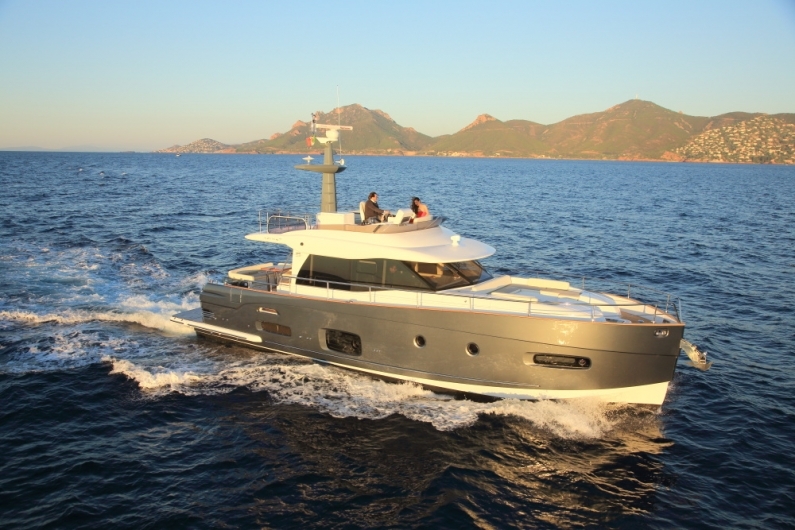 The 46 Sedan provides a light and airy saloon, galley and interior helm space with great all-round visibilty either at sea or when mooring or anchoring. Down below provides two spacious sleeping cabins and a well sized heads compartment and separate shower cubicle. This experienced and knowledgeable owner commissioned the boat with his own choice of exotic lightwood interior, teak and holly style flooring throughout and ultra-leather fabrics for the saloon and interior helm station. The interior deck level accommodation is all on one level throughout with galley forward to port, well proportioned helm station with side-deck access door to starboard, C-shaped saloon seating aft to port and TV/entertainments and storage running forward along the starboard side. The cockpit is accessed by superyacht quality, polished stainless steel sliding doors making the entire saloon exceptionally light and bright, well ventilated and providing a seamless flow from the inside accommodation to the exterior space. This is a great layout, highly sociable and ideal for entertaining. 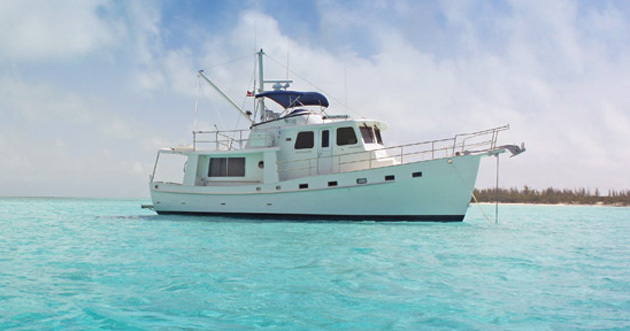 Externally the 46 provides everything you would expect from an established Explorer design, large cockpit, extended bathing platform, wide side & foredeck areas, wheelhouse side door and a spacious and easily accessed flybridge with full wet bar, ample seating for on-board entertaining and again, truly wonderful all-round visibility. The boat's exterior also features a range of bespoke elements. Custom stainless steel rails and biminis were designed and fabricated in-house with meticulous weld quality, polishing of the welds and overall hand polish finishing before being installed. Extensive use of teak, from the custom cap rails to a custom-designed swim platform, aft deck and side decks, all of which were measured and manufactured in our dedicated shipyard. The custom swim platform design includes integrated swim ladders, quick-install stand-up transom shower and a low-profile ADC tender davit. Options such as the Muir windlass and Italian anchor chain were also specified by the owner. 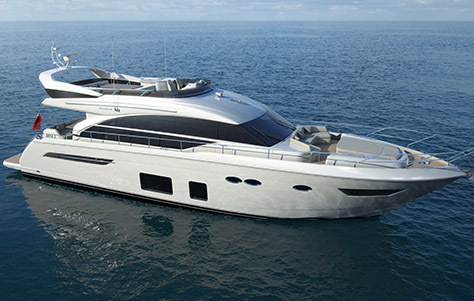 Other notable but standard features are the stainless steel saloon sliding doors, lower helm door and flybridge hatch from Aritex which are all polished to a mirror finish and of genuine superyacht quality. We crafted a top-of-the-line custom lower helm chair from MarineTech in Australia that blends beautifully with the dedicated helm area, well laid out instrument panel and surrounding dash again covered in leather. Not forgetting the custom wheel which took our experienced carpenters many days of careful work to handcraft and assemble, it is a detailed work of art. The smart use of LED lighting throughout, coupled with VIMAR light switches and dimmers, top-line door handles and reading lights further complement the contemporary look the owner wished to achieve. The following is a sample of the 'major item' specification extracted from the owners manual and original build specification. 2 X Cummins QSB6.7 425HP Marine Diesels on convention shaft drive to 4 blade fixed bronze propellers.